Bringing together five classic shooters in one package, Konami's excellent Gradius Collection for PSP lets gamers relive some of the most intense and timeless titles in gaming history. All of the games in this package are timeless video game classics, from the seminal first installment to the previously unreleased Japanese PlayStation title. Gradius' signature gauge power-up system, screen filling enemies, and inventive level designs remain timelessly appealing. The package also includes some extra material, multiple screen modes and more. It's a highly polished presentation that's an essential purchase for any classic shooting game fan. The legendary Vic Viper returns once again to battle the evil alien forces with the release of Gradius Collection on the PSP. This is an outstanding collection of five classic shooters that allows you to relive the games in nearly flawless emulated form on the PSP with some minor enhancements. All of the original arcade games are included, beginning with the very first game released in 1985. 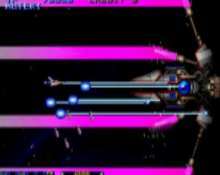 While Gradius seems a bit simple these days, its timelessly addictive gameplay, challenging bosses and innovative power-up gauge system remain just as appealing today as it did two decades ago. This installment set the stage for all the subsequent titles in the series, and gave players unprecedented freedom in terms of when and which power-ups to use. The other main innovation of the series was its unique boss structure, where the end-stage enemies would pose quite a challenge. While this version is slightly tougher and more elaborate than the version most players remember on the NES, Gradius has definitely withstood the test of time. Learning the familiar patterns and seeing old enemies once again is a definite joy and it's great to go back in time and re-experience these moments all over again. Who can forget the first time they went head-to-head with those Easter Island heads, or blowing up a those bubbles? Anyone who played this game certainly won't, and it's something to see them in the palm of your hand as vibrant and challenging as ever. The sequel, Gradius II was another solid installment that offered players more of what made the first installment so successful. This started the series' evolution, with a slightly more involved power-up system, though the biggest difference was the more elaborate level-designs that were much trickier to navigate. Some of the boss encounters were truly intense and challenging, with more elaborate patterns. By the time the series reached its third installment, the power-gauge system evolved again, and allowed players to select from several different gauges and shield types before each round. 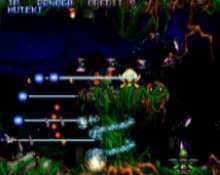 Gradius III stuck to the familiar formula, but increased the variety of enemies on each level. From a visual standpoint, the series' familiar look was become more defined with more colorful and imaginative enemies and levels. 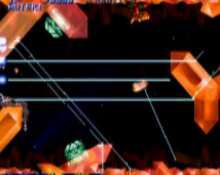 Gradius III's difficulty was also increased somewhat, with harder levels giving the player less room for error. This made the game more challenging, but also much harder. The penalties for losing your ship half-way through a level could be severe, making things become somewhat frustrating, requiring concentration, skill and enemy pattern memorization in order to survive some of the more intense areas. The original arcade series reached its conclusion and apex with Gradius IV, which further added to the already elaborate gauge system, allowing even greater customization at the pre-game with multiple weapons paths and upgrades available to the player. It didn't hurt any that this edition had the best visuals of any in the series to date, with a faster, smoother pace adding to the intensity. The levels here were the most elaborate yet, with dozens of enemies swarming the player, elaborate ballets of bullets that were hypnotic yet dangerous and some of the coolest boss encounters seen in the series to date. By this point, you can definitely see a more polished, intense shooter, with much better graphics, cooler sprite designs and even better soundtracks. 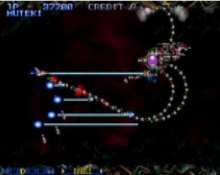 The solid gameplay didn't diverge too much from the Gradius Conventions, though the additional weapons types helped to increase the variety and challenge of the game. With so many options, the game's replay value was higher than previous installments, and the timeless controls and visuals have held up well. The series then took a rest for a few years, to resurface on the PlayStation with the release of Gradius Gaiden. Since it's never been commercially released in North America, it's inclusion here is a fantastic bonus. The fact that it's an awesome game and another brilliant installment in the series is a given, but its inclusion alone makes Gradius Collection worth it for shooter fans. While the basic parameters of Gaiden were similar to the older games, the power-gauge system was again evolved, allowing even more flexibility. Gaiden also let players select from several types of Vic Viper ships at the start of each stage as well, with each offering a fairly distinct set of weapons and power-ups. This installment also innovated with 3D polygonal enemies and a more varied design, which gave the game a fresh look and feel. The enemy patterns were also a bit more intense, making Gradius Gaiden the fastest and most challenging in the series to date. All of the titles on Gradius Collection have been emulated beautifully, with arcade perfect visuals and soundtracks intact. The games look fantastic on the PSP screen in full-mode, though the action can be a bit hard to follow when they're letterboxed. Players can select from either a wide-screen, full screen or the arcade proportions for each game. Gradius Collection also includes additional options allow you to select auto or manual power-ups, level of difficulty, number of ships and continues. In addition, players can choose to play the games in either original mode or enhanced, which features better balance to the gameplay and fixes some of the slowdown the plagued the original game. Gradius Collection also lets players view cinema scenes from various earlier compilations and listen to some of the famous music tracks as well. The complete package is nicely presented with a beautiful menu screen that's easy to navigate, making for a solid package that should please retro gaming fans. While the games themselves might seem a bit dated by today's standards, less cynical players will most likely find that the games have held up remarkably well. Playing through these seminal installments in the Gradius series, you are immediately struck by just how brilliant they are in terms of construction and presentation. There are many threads, such as boss characters that appear through the series that keeps the games together, and playing Gradius' titles sequentially allows you to see how the series evolved over time. As far as classic games compilations go, this is one of the rare packages that offers a cohesive and comprehensive look at a complete series of games, instead of seemingly random older titles squeezed onto the same disc. While the pull of nostalgia is strong here, the tight controls, cool weapon and, challenging gameplay makes Gradius Collection's appeal both immediate and timeless.